Organizations selling a mix of low and high margin products may have commissions defined for individual products or product families. When commissions are based on the product (Subscription Plan),commissions are calculated on all orders that are associated with the product(Subscription Plan). For example: Product X has a 10% commission associated with it. All orders for product X, that have invoices generated, will have a 10% commission calculated. NOTE: In the BluSynergy system, a product can have different subscription plans associated with it. Commissions plans may be applied to all plans associated with the product or on just one plan for the p froduct. In order to represent this feature, we have the (Subscription Plan) in parenthesis. The following are steps to set up a commission structure if you would like the commission to be applied to a Product(Subscription Plan). Name your commission plan, select the billing plan that the commission is to be applied to. Next, you have the option to assign a Sales Agent Group. This selection is made only if all commissions are to be attributed to a particular sales agent group. If the sales agents differ for every order then leave this blank. Check the check box by the "Is Active" to enable commissions for the Plan. For the commission charges, enter a commission code, commission text and the accounting code that your commissions are recorded under in your ERP system. Amount - When amount is selected, this flat amount is used as commission on each invoice generated for this plan. 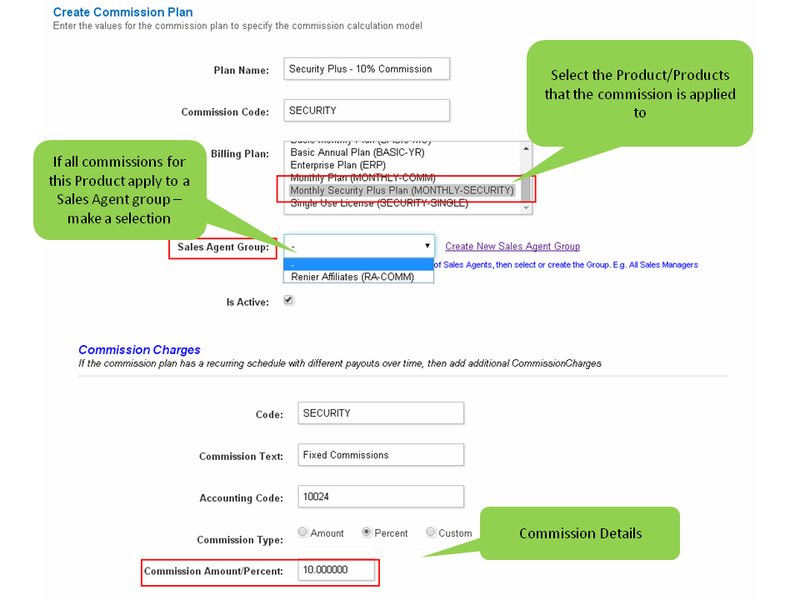 Example: If $100 is the commission amount, for every invoice that is generated for the monthly security plus plan, $100 is calculated as commission. Percent - If a percent is selected, then the commission is the invoice amount times the percent. 10% of the invoice amount. Note: The commissions thus calculated are NOT deducted from the invoice, nor will they appear on the invoice. Charge Type: describes the frequency with which the commission is calculated. One Time Charge - As the name suggests, commissions will be calculated once, on the first invoice generated. In the above example, figure 2, we have a 5% commission, this would be charged on the first Invoice generated from the order the commission is associated with. Recurring Charge - Recurring commission charges are applied on all invoices generated from the order the commission is associated with. Example: 5% Commission recurring charge is applied every invoice generated. Date Based Recurring Charge - Recurring commission charges are applied on all invoices until the selected date. Example: If the time frame selected under the date based charge type is 2 years, commission will be calculated on all invoices generated for a period of 2 years. 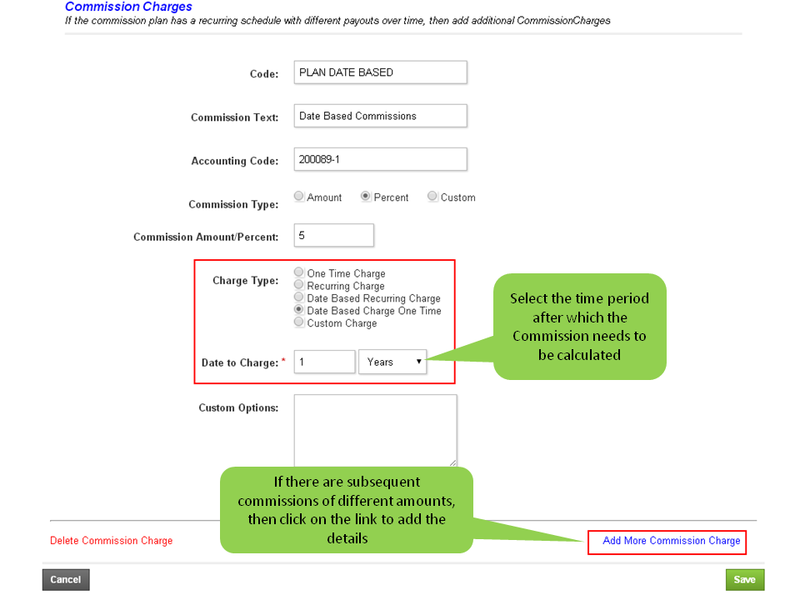 Date Based One Time Charge - If commissions change from a particular time period of say 1 year, this charge Type is selected. To enter commissions for Year 2 & 3, click on the link "Add more commission charges" and in the "Date to charge" enter 2 and 3 Years respectively.